The Students of Resonance Commerce and Law Program at Kota have performed remarkable in CS-Professional & CS Executive (June-2017) examinations, the result declared by the Institute Of Company Secretary of India on 25th August 2017. 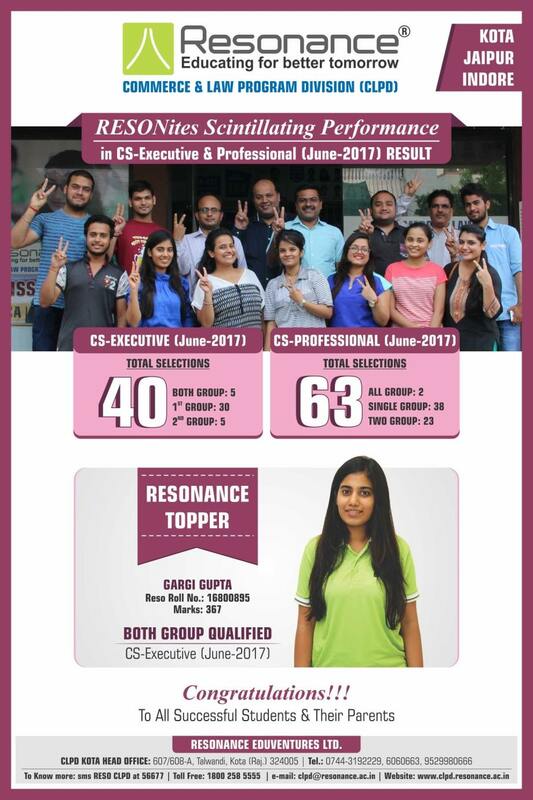 In CS-Executive June 2017, 14 student got success from which GARGI GUPTA Cleared both Group and top the Institute. Total 8 students cleared Group-I & 5 students Cleared Group-II. In CS-Professional June 2017, 16 student got success from which Total 4 students Cleared two Group & 12 students Cleared Single Group.